- The Labrador Retriever - This dog breed originated in Greenland and is part of the Gun-dogs Group, they appear in Black, Chocolate, Silver and Yellow. They are popularly known as "Labs" and are one of the best-known breeds in the World today, similar dogs where used by fishermen to retrieve fish that escaped from the fishing lines and help pull back in the fishnets around the 18th century in Greenland. It was introduced into the United Kingdom in the late 1800's and gained it's reputation in field trials, with a stable temperament suitable for a variety of activities beyond hunting. It is also seen to be the most popular breed for service dogs, affectionate, gentle, energetic and very intelligent, "Labs" are one of the most obedient and reliable dog breeds on the Planet. They are happiest out in the country side but nevertheless they are adaptable and will be happy among children and be a devoted family pet. Labradors are eager to work and play with enthusiasm. The breed is energetic, strongly built, have good nature, express intelligence, and are very fond of water. These dogs have a tendency of gaining weight quite easily if regular exercise is not given so beware of overfeeding. 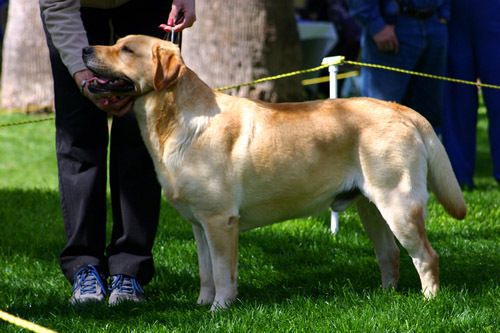 Click here to know even more about the Labrador Retriever Dog Breed.